I recently opened up about my personal fear of doing evangelism in the Muslim markets in Paris. I’ve been doing some more thinking along those lines and would like us to consider more about the nature of fear and the nature of God. I was talking with some of my MEI cohort members about the nature of God and how sometimes we lean too exclusively toward the transcendence of God—God is mighty and distant and all powerful, concerned only with judging us. Then at times we lean a bit too much on the immanence of God, believing that God is present in a personal way—God is your buddy and life coach and hooks you up with sweet parking spaces. It got me wondering, have we perhaps made God so personal that we no longer touch the mystery and mastery of God’s holiness, instead making God an eccentric, benevolent, wealthy uncle of some sort? But if we think God is so removed and unknowable and arbitrary and disengaged, do we not miss the reality of how God reveals God’s self in the absolutely ordinary? Mark seems to point to the fact that God is immanent: God is actually in the boat and in the storm. But that God is also transcendent. God commands the wind and waves and they stop. All of that might have something to say about how we see meaning in the storms of our own lives. 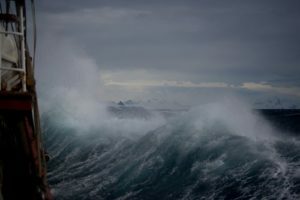 Being fearful while in a storm at sea is not exactly an irrational fear like pogonophobia (fear of beards). If the disciples have awakened Jesus from his slumber out of a mortal fear of their own beards, then we would be having a different conversation. If they were freaking out it was not due to neuroses or an anxiety disorder: their boat was about to sink. As human beings we are wired for certain responses when our lives are in danger. Adrenalin is released in our brains, our heart rate increases, our pupils dilate and we become hyperaware of what’s happening around us. Yet although we don’t exactly choose to react like this, Jesus rebukes the wind and waves, then turns to his disciples and says, “Where is your faith?” It feels like an accusation. Is he really saying that if we have enough faith we can somehow transcend our animal brain chemistry? Maybe when Jesus asked, “Where is your faith?” he said it not as accusation but as invitation—not a rhetorical question but an invitation to reflect on where God is in the midst of storms. Is God immanent or transcendent? Maybe he was inviting the disciples to reflect on what it means to be alive on the other side of a situation they thought would kill them. For us, that situation might be a divorce, an illness, the death of a parent or even a child, the loss of a job, depression or middle school. It can feel as if it’s going to kill us. Maybe, if we survive the situation, we are being encouraged to ask questions. Where was my faith? Where was God? What did I fear? I wonder if “Where is your faith?” is an invitation to reflect on what it means to be God’s people—especially when being God’s people doesn’t give us special dispensation for an easier, storm-free life. Both New Age and prosperity gospel thinking would have us believe that if we just have enough faith—or think positively enough—we will draw only good things to us. But life doesn’t work like that. Bad things happen to all people. To think that storms happen because we didn’t think enough positive thoughts or practice the right kind of religion is just spiritual narcissism. Faith and/or positive thinking are not some kind of shamanistic formula for a storm-free life. But faith is a way to find meaning. So what moves us from fear to faith? Or at least, what enables us – even if we are afraid of something that is unknown, challenging, difficult, or threatening – to act in faith rather than be paralyzed by fear?